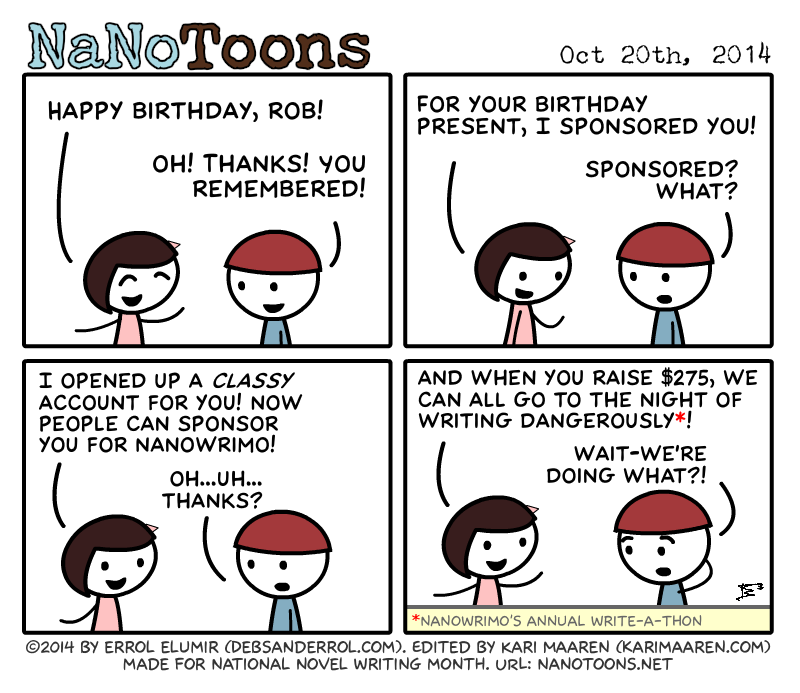 And, with just under two weeks to go until National Novel Writing Month, NaNoToons starts up again- keep up the good work Errol and cohorts. Errol: Hello! It’s the 20th, and here’s the first comic! Huzzah! I don’t have a script for November, and I usually have one now, but that’s ok! It will be just like NaNoWriMo. Heh. And yes, as you can surmise from this comic, the crew is going off to Night of Writing Dangerously! This entry was posted in Uncategorized on 20/10/2014 by mercenarypen. Well, I’ve been sharing every post I’ve made on facebook since I started- and you’ve liked at least one of those facebook posts- specifically the one about NaNo prep as I recall. I even cited you and Manda as two of the people who inspired me to try this. This is what happens when you don’t pay attention properly.